The overarching objective of the Basel Convention is to protect human health and the environment against the adverse effects of hazardous wastes. Under the Basel Convention, Parties have specific obligations to transmit certain information to each other. This includes notifications of national definitions of hazardous wastes in addition to those listed in the annexes of the Convention; and decisions to restrict or prohibit imports and/or exports of hazardous or other wastes. The current leaflet provides information about these notifications in a concise manner. The format to be used for national reporting for the year 2016 and onwards incorporates a number of revisions to the previous format. These revisions were adopted by the Conference of the Parties to the Basel Convention by decisions BC-12/6 and BC-13/9. The revised format is available for download here. The Manual for completing the format for national reporting aims to assist countries in understanding the type of information to be provided in national reports. It also includes the questions of the reporting format and is available in all United Nation languages. The Manual is available in Arabic, Chinese, English, French, Russian and Spanish. The format to be used for national reporting for the year 2002 to 2015, together with a manual intended to assist Parties in completing that format, were adopted by the Conference of the Parties by decision VI/27. The format is available for download here. The user manual for the electronic system (ERS) of the Basel Convention provides an overview of the key features of the ERS and explains the various ways in which users can submit information through the system. The manual is available here. The Guidance Document on Improving National Reporting was developed by the Implementation and Compliance Committee to assist national technical officials with the preparation of the national reports. The Guidance pertains to the format for reporting 2015 and prior years. It will be updated to address revisions to the reporting format adopted by decisions BC-12/6 and BC-13/9. This document is available in Arabic, Chinese, English, French, Russian and Spanish. The Benchmark report was developed by the Implementation and Compliance Committee of the Basel Convention. The report is intended to demonstrate what a national report might ideally look like, and to give some advice on what to avoid when preparing the national report. The Conference of the Parties to the Basel Convention during its tenth meeting took note of the report and encouraged Parties to use it. The Guidance pertains to the format for reporting 2015 and prior years. It will be updated to address revisions to the reporting format adopted by decisions BC-12/6 and BC-13/9. The report is available here. 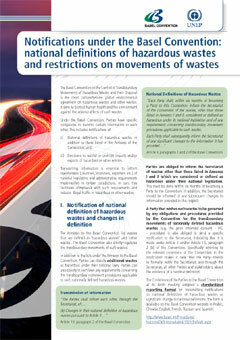 The Methodological guide for the development of inventories of hazardous wastes and other wastes under the Basel Convention aims to provide guidance to the Basel Convention competent authorities and other stakeholders on the methods of developing national inventories for the preparation of the annual national reports. The guidance is available for download here. The draft Practical guidance for the development of inventories of used lead-acid batteries, waste electrical and electronic equipment and waste oils aims to provide practical instructions to assist Parties and others in developing inventories of specific wastes. It is meant to be used in conjunction with the Methodological guide for the development of inventories of hazardous wastes under the Basel Convention. The draft Practical guidance is available for download here (complete English version). Please click here to see comments received on the draft Practical guidance documens. Imports of hazardous wastes by developing countries and countries with economies in transition are decreasing and exports from those countries to developed countries, where it is assumed these wastes can be treated in an environmentally sound manner, are increasing. Even though the ban on export of hazardous wastes from developed countries to developing countries adopted by the Conference of the Parties to the Basel Convention has not yet entered into force, such transboundary movements are already decreasing. The trends observed may, at least partly, be caused by underreporting by Parties. There is no evidence that significant amounts of hazardous wastes are being transferred from richer countries to poorer countries. 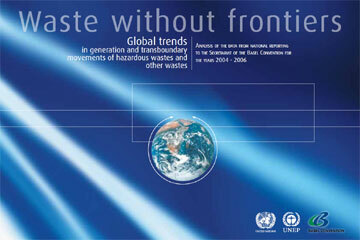 The quantitative information presently received about transboundary movements is satisfactory, but more information is needed about the generation of hazardous wastes and the quality of treatment in the states of import, to be able to assess if the goal of environmentally sound management of wastes is being achieved. More information on illegal movements should be made available and analyzed more systematically to detect areas of implementation of the Convention where further improvement could be made.